*As measured by the Gini-Coefficient. The Gini index is a measurement of the income distribution of a country’s residents. This number, which ranges between 0 and 1 and is based on residents’ net income, helps define the gap between the rich and the poor, with 0 representing perfect equality and 1 representing perfect inequality. CICH graphic created using data adapted from Organisation for Economic Co-operation and Development. (OECD). 2008. 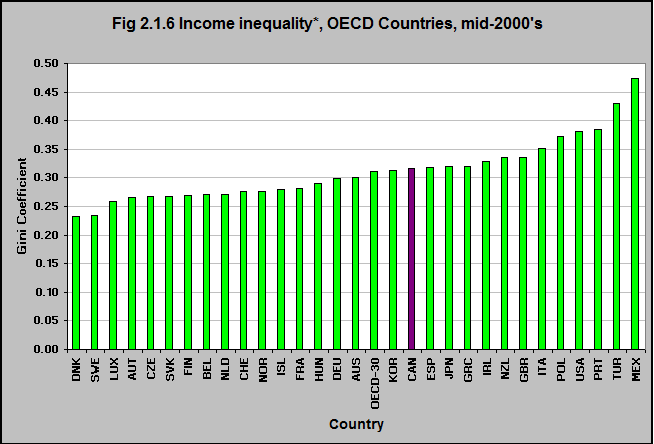 Growing Unequal: Income Distribution and Poverty in OECD Nations. Paris: OECD. http://www.oecd.org/els/soc/growingunequalincomedistributionandpovertyinoecdcountries.htm#Did_you_Know – accessed June 15, 2017. Canada is among the Organisation for Economic Co-operation and Development (OECD) nations with higher income inequality. According to a report by the OECD, Canada is one of the two wealthy countries out of 30 showing the largest increases in income inequality from the 1990s to the mid-2000s. Research demonstrates that income inequalities are intricately connected with the health of a population. Thus, in general, the greater the level of income inequity in a country, the poorer the health of the population. The lesser the level of income inequity, the better the health of the population. Those with the lowest incomes have the worst health outcomes, but the negative impact of inequity is felt among all Canadians. **Market income is the total income before tax minus income from government sources. http://www12.statcan.gc.ca/census-recensement/2006/ref/dict/pop069-eng.cfm -accessed July 20, 2017. 1Mikkonen, J., & Raphael, D. (2010). Social Determinants of Health: The Canadian Facts. Toronto: York University School of Health Policy and Management. http://www.thecanadianfacts.org/the_canadian_facts.pdf- accessed June 12, 2017.